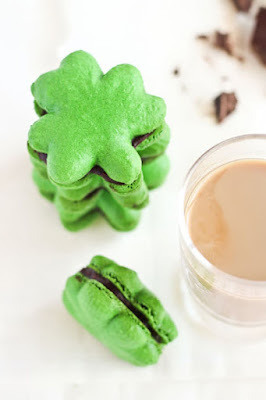 Shamrock Macarons ~ You better believe there's Bailey's chocolate ganache in these sandwich cookies. 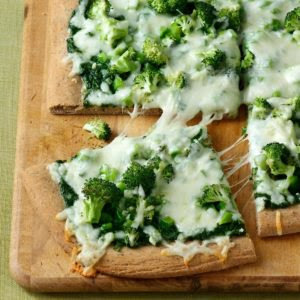 PESTO VEGGIE PIZZA ~ When I was thinking about what my family likes to eat and what I like to cook, the answer was pizza! 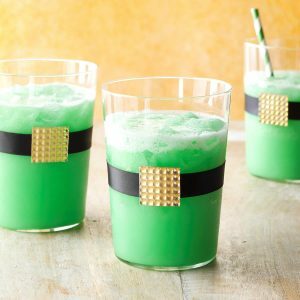 PIRATE PUNCH ~ The nice tang to this punch, crowned by foamy topping makes it a very refreshing drink. 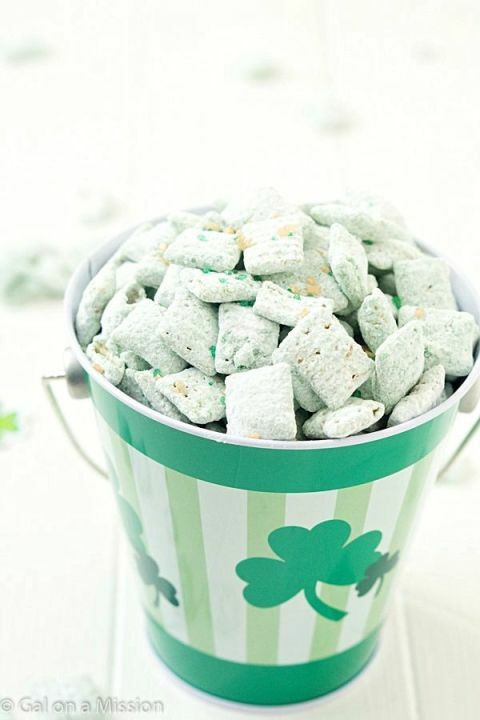 Children love it! BAKED CREAMY SPINACH DIP ~ I'm a fan of classic dishes but frequently tweak them a bit to suit my family's tastes. 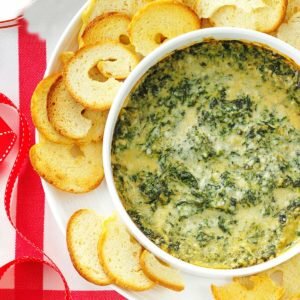 My cheesy spinach dip is a little lighter than other versions I've seen and pairs well with bagel chips. LEPRECHAUN LIME DRINK RECIPE ~ You won't need the help of lucky little elves to ready this refreshing lime concoction. 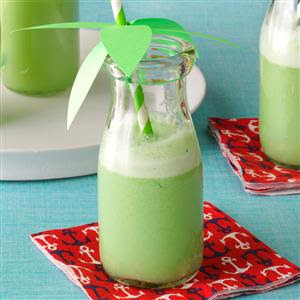 Cheery garnishes can be fixed in a wink to dress up each guest's glass. 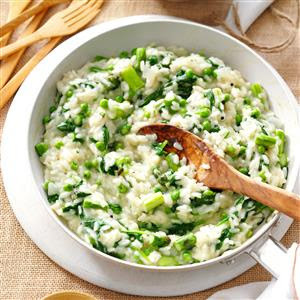 GARDEN RISOTTO RECIPE ~ With asparagus, spinach and peas, this simple side adds spectacular flavor and tons of health benefits from green veggies. Add some Parmesan cheese, and you've got one delectable dish! 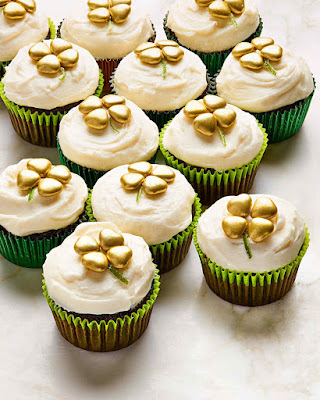 Chocolate-Stout Cupcakes ~ Who needs four-leaf clovers when you have these treats? Chocolate cupcakes, mixed with Guinness beer and topped with shamrocks heart-shaped almond candies plus a sliver of sugared lime zest. GINGER-KALE SMOOTHIES RECIPE ~ Since I started drinking these spicy smoothies for breakfast every day, I honestly feel better! 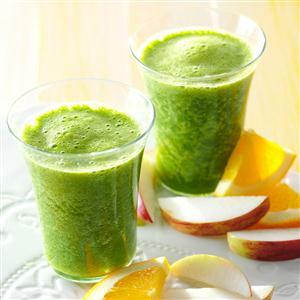 Substitute any fruit and juice you like to make this recipe your own healthy blend. 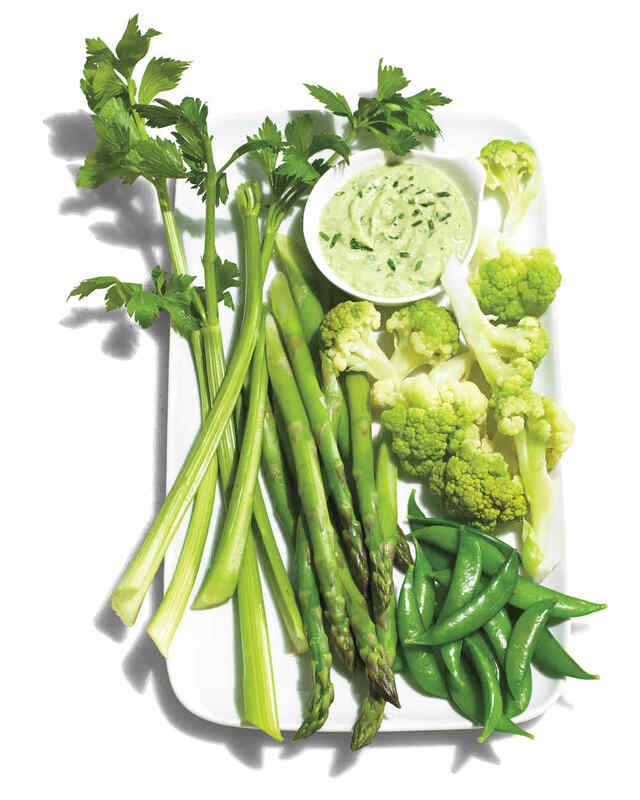 Green Crudites with Green Goddess Dip ~ Lightly blanched asparagus, cauliflower, and snap peas work well with raw produce such as celery and sliced cucumbers. The green goddess dip features creamy avocado, buttermilk, and finely chopped herbs. 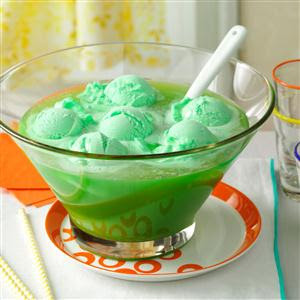 LEMON-LIME PUNCH ~ This frothy refresher topped with lime sherbet is a longtime family favorite and the best punch I’ve ever had. 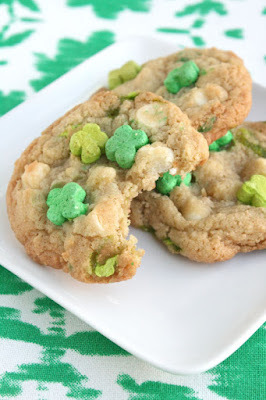 It’s fast, festive and easy to mix up for a variety of occasions. 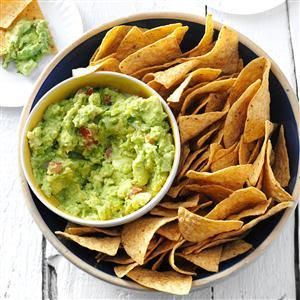 Standout GUACAMOLE ~ Get the scoop on making a standout guacamole. A handful of chopped celery adds some fun crunch in this avocado dip—everyone’s favorite fiesta starter. 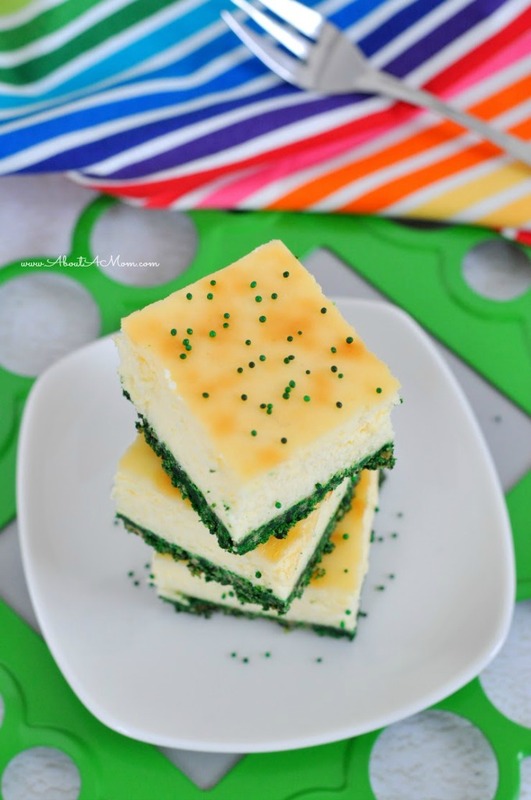 Green Velvet Cheesecake Bars ~ If red velvet is the cake of choice on Valentine's Day, green velvet is the thing to bake on St. Patrick's Day. 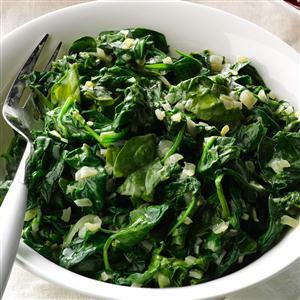 CREAMED SPINACH WITH PARMESAN ~ Cooked spinach makes a perfect accompaniment to many entrees, especially salmon. Lucky Charms Cookies ~ These white chocolate chip cookies have a St. Patrick's Day twist: marshmallow cereal bits!